Eliza (Jenn Robinson) makes quite an impression on the Eynsford -Hill family (Todd Mazzie, Ruth Vernet, and Erin Schwartz) under the watchful eye of Mrs. Higgins (Margaret Lane). “The difference between a lady and a flower girl is not how she behaves, but how she is treated.” This idea is at the heart of the class and gender commentary in the classic George Bernard Shaw play “Pygmalion,” now playing at Kensington Town Hall. More widely known by its musical version, “My Fair Lady,” “Pygmalion” is the story of Eliza Doolittle (Jenn Robinson), a Cockney flower girl who comes across a famous speech specialist, Henry Higgins (Dan Owen) one rainy night. Along with his colleague, Colonel Pickering (John Allnutt), Higgins decides to take on the challenge of teaching Eliza to speak like a lady, and trying to pass her off as gentility at an important social event. Helping in her transformation is the indomitable housekeeper Mrs. Pearce (Sam David) and Henry’s mother (Margaret Lane). During an awkward “try-out” of Eliza’s new skills, she meets the Eynsford-Hill family; Mrs. (Ruth Vernet), young Clara (Erin Schwartz) and most importantly Freddy (Todd Mazzie), who is immediately smitten. Also in the mix is Eliza’s absentee father Alfred (Roger Stone), who is always trying to work an angle. …an interesting and enjoyable turn at a classic story of the English language. Eliza is frequently dehumanized by the male characters in the play; her father tries to “sell” her to Professor Higgins, Higgins frequently refers to her as a “baggage” or a “squashed cabbage leaf” and even the kind-hearted Colonel Pickering joined in self-congratulations on the conclusion of their successful “experiment.” Even Freddy, whose affection seems genuine, wants to possess Eliza as his wife. Only the other female characters, particularly Mrs. Pearce and Mrs. Higgins, see Eliza as a human being and express concerns for her welfare. To me this is the ultimate element of a play with so much societal commentary; it doesn’t give you easy answers because there are none. Instead, it hopes to foster conversation and debate. Robinson navigates both of Eliza’s tricky accents very well, successfully demonstrating how far Eliza comes in a short time. She also brings a lot of feeling to the part, allowing the audience to experience the confusion, frustration, and humanity of this complex character. Owen is an incredibly effective Higgins, making his character’s brusque behavior and temper comedic; Higgins on the page is an easy character to dislike, but Owen instills a charm that allows the audience to remain sympathetic to this “confirmed old bachelor.” Allnutt is warm and humorous as Pickering, often trying to diffuse the tense situations brought about by his compatriot, Higgins. Stone brings a classic character to life, with a charisma which is at turns engaging and infuriating. David and Lane provide hilarious challenges to Higgins’ authority, and Vernet, Mazzie and Schwartz provide effective foils to Higgins’ temper. All in all, it is an interesting and enjoyable turn at a classic story of the English language. 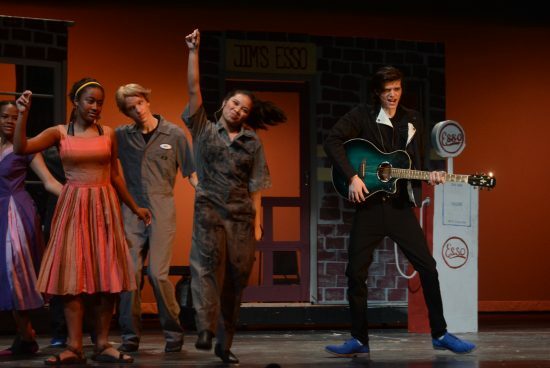 The stage design is very effective, as it allowed several varied locations to be represented in a small amount of space, from an outdoor park to a warm and cozy study (set design by Maggie Modig). The costumes were also very impressive, appearing both historically accurate and emphasizing the differences in class between the characters (costume design by Harlene Leahy). This production is very capably directed by Pauline Griller-Mitchell. Running Time: Approximately 2 1/2 hours with one 15-minute intermission. Advisory: Due to some adult language, this show is recommended for audiences over 16. 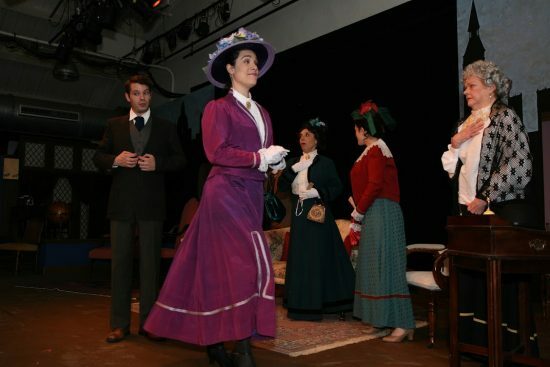 “Pygmalion” is playing now through April 9th at Kensington Town Hall. For more information and to order tickets, please click here.